Fig Tree Institute is a non-profit organization that exists to re-establish the Hebraic roots of Judeo-Christian faith and to advocate the return to the first century Apostolic faith of Jesus of Nazareth (Yeshua of Natzeret) by seeking a better understanding of the history, culture, and religio-political background of that era. It is our hope that through our humble efforts, the division and schism which exists between Jewish and Christian communities can be bridged. Please feel free to browse our website and download resources under the Resources tab on the top of this page. We look forward to serving you in any way we can by helping you deepening your relationship with G-d and your understanding and the teachings of Yeshua of Natzeret. Oct 2, 2017 - Fig Tree Institute is pleased to announce the availability of 'Messianic Prophecies in Historical Succession' for free download via the institute's website resources page. "This is is a delightful theme, a joyful work... The Messiah is in the process of coming in the Old Testament, in drawing near, in proclaiming His appearance, and we design to transport ourselves into this Old Testament period, and follow the steps of the One who is coming, pursue the traces of the One who is drawing near, seek out the shadows which He casts upon the way of His Old Testament history, and especially seek to understand the intimations of prophecy respecting Him." Franz Delitzsch, born at Leipsic Feb. 23, 1813; died there March 4, 1890, was a German Lutheran theologian and Hebraist. He devoted himself early to Semitic studies, was made assistant professor at Leipsic in 1844, and was called as professor to Rostock in 1846, to Erlangen in 1850, and in 1867 to Leipsic, where he spent the remainder of his life. Delitzsch wrote many commentaries on books of the Bible, Jewish antiquities, Biblical psychology, as well as a history of Jewish poetry, and works of Christian apologetics. Today, Delitzsche is best known for his translation of New Testament to Hebrew (1877), and a series of commentaries on Old Testament published with Carl Friedrich Keil. Aug 8, 2015 - Fig Tree Institute is pleased to announce the availability of 'The Synagogue and The Church' for free download via the institute's website resources page. "Nothing is of more importance than that we should have right notions respecting a Christian Church, its Constitution, Regulation, Ministry and Services, — if we would avoid the extremes of disregarding Church ordinances on the one hand, or of unduly extolling them on the other... Scripture has given us no direct information in a systematic form; there are, indeed, incidental allusions to it, and we find a divine sanction clearly given to regular Christian communities; but we have no express declaration as to what should be their constitution. It will be of use, then, to inquire into the constitution and practices of the Jewish Synagogue, and to ascertain whether, and how far, Christian Churches were formed on that model — were, in fact, of the character of Christianized Synagogues." Vitringa, who pursued this inquiry with much diligence and much success, was born at Lewarden, in Friesland, in the year 1659. At an early age he learned Hebrew and Greek, and acquired such a knowledge of these languages, as to be able to read the Scriptures in the originals. In 1682 he obtained theology degree at University of Leyden, and in 1693 he was made professor of sacred history. He passed the last years of his life in constant suffering, and died of apoplexy, in 1722, aged sixty-three years, leaving behind him several works, the most important of which is this book now presented to the public in a condensed form by Joshua L. Bernard. July 17, 2015 - Fig Tree Institute is pleased to announce the availability of 'The Hebrew-Christian Messiah' for free download via the institute's website resources page. This book (consists of 12 lectures) is, in the first place, an attempt to understand the motives with which the author of the First Gospel composed his book, and to interpret his words in the sense in which he desired the contemporary believers of his own race to apprehend them. This is not easy for us who live in the twentieth century, and have been brought up in Christian and non-Jewish surroundings. But the attempt must be made. Thirdly, the writer hopes that incidentally his work may be of service in the cause of presenting Christ to the Jews of today, whether by a more exact statement to them of the nature of portions of Christian truth than is generally offered, or by a clearer elucidation to Christians of the difficulties felt by many Jews in accepting Jesus as their Messiah. What makes his figure as the Messiah so much different than the various false Messiahs over the years? What was commonly believed by Jewish people and their forefathers 2,000 years ago about Messiah? 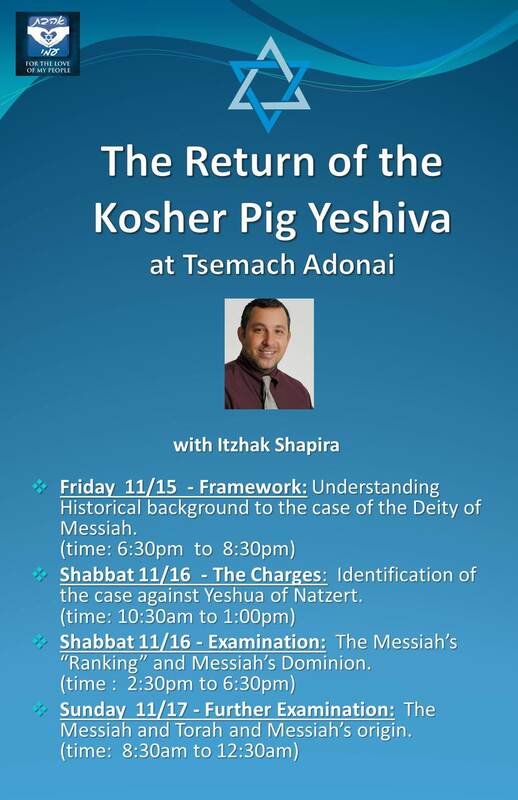 Rabbi Itzhak Shapira will give a series of lecture to investigate the historical Jewish thoughts on Messiah and explain why the claims of Yeshua of Natzeret were not at all foreign to the belief of Jewish people 2,000 years ago.